The Indian Space Research Organisation (ISRO) is planning on carrying out the longest mission of its PLSV launch vehicle on Monday, Sept. 26. The rocket is slated to deliver eight satellites to orbit after it lifts off from the First Launch Pad at Satish Dhawan Space Centre (SDSC) in Sriharikota, at 9:12 a.m. local time (03:42 GMT; 11:42 p.m. EDT on Sept. 25). The mission, designated PSLV-C35, should last two hours and 15 minutes – making it the longest PSLV flight to date. Usually, the rocket needs about 20 minutes to place its payload in orbit; however, this time, it will take much longer to conclude the mission as the satellites will be put into two different orbits. In order to insert payloads into various orbits during one mission, the engineers will have to shut down and restart the fourth stage of the PSLV rocket, called PS4, twice during the flight. ISRO has mastered this multiple burn technique, testing it in the previous two PSLV flights. “The campaign is in full swing for the launch of the PSLV-C35 on September 26. We have planned to release its different payloads at two different orbits this time. This will be a first multiple orbit launch in a single PSLV mission using the PS4 restart method,” said P. Kunhikrishnan, director of SDSC. The launch of the mission was originally targeted for August 2016; however, ISRO re-scheduled it and has not disclosed the cause of this delay. 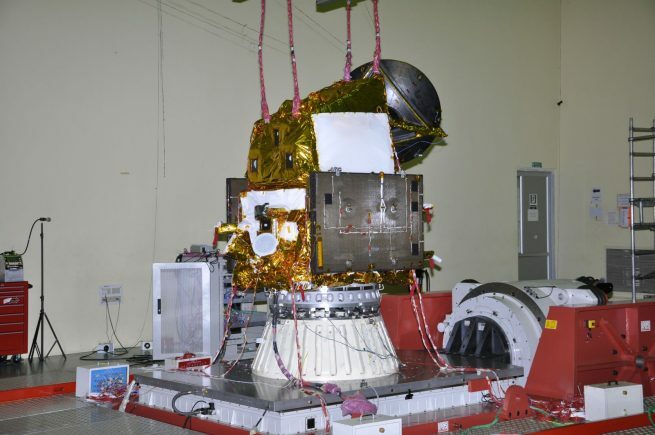 The mission’s primary payload is ISRO’s ScatSat-1 (Scatterometer Satellite-1) weather satellite; it will be released first, approximately 17-and-a-half minutes after lifting off. If everything goes according to plan, the spacecraft will be placed into a polar Sun-synchronous orbit (SSO) at an altitude of 447 miles (720 kilometers), inclined 98.1 degrees. Then the other seven satellites will also be released into a polar SSO, but at an altitude of 416 miles (670 kilometers) during the last two minutes of the flight. The car-sized ScatSat-1 satellite, which weighs in at approximately 818 pounds (371 kilograms), is based on the IMS-2 bus. The spacecraft features two deployable solar arrays capable of generating about 750 W of power and is equipped with a Ku-band scatterometer with a mass of around 242 pounds (110 kilograms). The designed operational lifetime of the satellite is five years. The PSLV-C35 mission also includes three passengers from Algeria: AlSat-1B, AlSat-2B, and AlSat-1N. They will be operated by the Algerian Space Agency (ASAL). 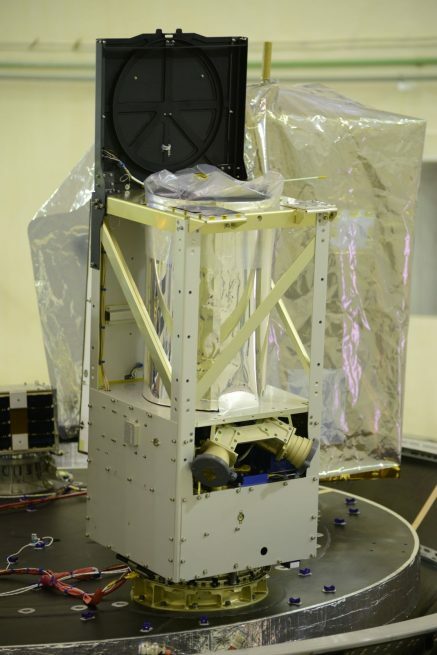 AlSat-1N, also known as AlSat-Nano, is a three-unit CubeSat built by Surrey Space Centre. With a mass of 15.4 pounds (7 kilograms), the nanosatellite will be used to demonstrate new and innovative space technologies. It will be operated jointly by ASAL and the UK Space Agency. One commercial payload will also be launched by PSLV-C35 – the Pathfinder-1 high-resolution imaging microsatellite. Developed by Spaceflight Services, the satellite will be operated by a U.S. company BlackSky for up to three years. Pathfinder-1 weighs some 97 pounds (44 kilograms) and is the first of two demo satellites (Pathfinder-2 is scheduled to be sent into space in November 2016) for the company’s network of Global spacecraft, slated to be launched in 2017. “Pathfinder-1 and Pathfinder-2 will serve as demonstration satellites and play a vital role in ensuring that all the necessary functions of the satellites are operating properly. Both are standard Earth observation satellites and will focus on one-meter imaging,” Rakesh Narasimhan, executive vice president and general manager of BlackSky, told SpaceFlight Insider. Monday’s mission will also loft a Canadian three-unit CubeSat nanosatellite, named CanX-7 (Canadian Advanced Nanospace eXperiments 7), also known as NLS-19. It was built by the University of Toronto and weighs approximately 17.6 pounds (8 kilograms). The tiny spacecraft is a technology demonstrator that will deploy a drag sail to perform experiments to help reduce space debris and for tracking commercial aircraft. The 144-foot (44-meter) tall “G” version of the PSLV, which will be used for Monday’s mission, is the is the standard configuration rocket with a mass of 295 metric tons at liftoff. It was fitted (for the first time since 2011) with six of the smaller S9 strap-on solid rocket motors. Monday’s mission will be India’s sixth launch this year and the 37th flight of the PSLV booster overall. The country’s next flight is currently scheduled to take place in December when a GSLV rocket is scheduled to send ISRO’s GSAT-19E communications satellite into orbit. However, the exact date of that launch has yet to be announced. This proves that ISRO has become an reliable agency in satellite launching capabilities.